“Compromised Windows Security” is the PUP that uses misleading techniques to prevent removal. Use Reimage to locate malicious components and get rid of them faster than with uninstall instructions. A full system scan blocks virus reappearance and prevents traffic to malicious domains. What lies behind "Compromised Windows Security" notifications? When does the adware take over the PC? What lies behind “Compromised Windows Security” notifications? 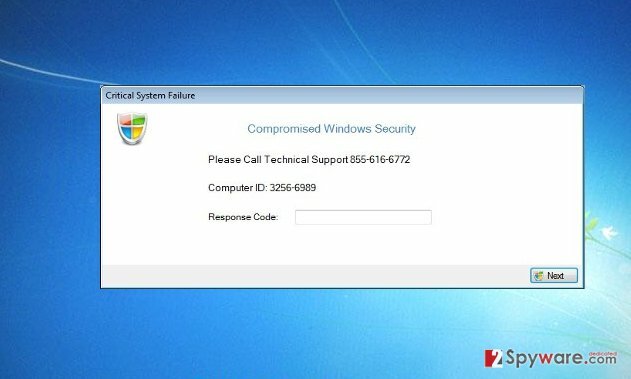 Compromised Windows Security virus generates fake notifications of a supposedly corrupted operating system. While users who are not familiar with scam might rush to fulfill the requirements, others know the true intentions of such notifications. What you are dealing with is adware. When this application succeeds in infiltrating the operating system, it starts displaying fake alerts and notifications. Moreover, they provide a phone number of a technician which will save you from these sufferings. Though this number might look like the light at the end of the tunnel, in fact, it is a well-designed scheme. Thus, we recommend you to remove Compromised Windows Security at first. If you are not sure how to do it, let Reimage help you. Though this adware does not possess elaborate and complex features as a trojan or another highly aggressive computer threat – ransomware – however, its visit should not be ignored. Therefore, Compromised Windows Security removal should become your current priority. This adware is another sample of tech support scam. Lately, there has been a steady increase of this deception forms. Needless to say, it is highly effective as users who encounter this scam for the first time, fall for the scam and contact the supposed technical support specialist. Later on, he or she tries to convince the victim that in order to solve current issue, the user needs to purchase additional software which would guarantee the safety of the operating system. Since cyber security is a sensitive topic and each of us is cautious to escape computer threats, the victim might behave according to the crook’s expectations without giving it a second thought. Likewise, Compromised Windows Security ads work the same way. The alerts display 855-616-6772 number. They are designed to look genuine. Alerted that a virus might infect your system, you might consider calling the number. Obviously, neither you nor any other victim of this scan should fulfill crooks‘ requirements. In fact, you might make matters worse as you download a potentially fraudulent malware removal application. Therefore, real threats might settle on your operating system. Then, you might really need to clean your device. Though these adware applications look more sophisticated than mere PUPs, their distribution techniques are not exceptional. In fact, the adware sneaked into the device when you installed a new application. Unaware that it comes with bonus programs, you quickly rushed through the guide. Unfortunately, due to this habit, you facilitated Compromised Windows Security hijack. If you are interested in the prevention ways, you should keep in mind these recommendations. First of all, upon installing a new application, select “Custom” settings. They will disclose optional add-ons. Unmark them carefully not to install adware again. The best way to terminate “Compromised Windows Security” virus would be to use automatic method. Install an anti-spyware application and run the scam. Usually, Compromised Windows Security removal requires only a couple of minutes. Therefore, you can be sure that the application completely roots out the adware. It also comes in handy when warding off more threatening virtual threats. If you are willing to remove Compromised Windows Security manually, you can find the instructions below. However, keep in mind that this virus might have spread its files throughout the entire registry, so you will need to be very vigilant. Here, look for “Compromised Windows Security” or any other recently installed suspicious programs. Wait until you see Applications folder and look for “Compromised Windows Security” or any other suspicious programs on it. Now right click on every of such entries and select Move to Trash. When in the new window, check Delete personal settings and select Reset again to complete “Compromised Windows Security” removal. Once these steps are finished, “Compromised Windows Security” should be removed from your Microsoft Edge browser. Here, select “Compromised Windows Security” and other questionable plugins. Click Remove to delete these entries. Now you will see Reset Firefox to its default state message with Reset Firefox button. Click this button for several times and complete “Compromised Windows Security” removal. Here, select “Compromised Windows Security” and other malicious plugins and select trash icon to delete these entries. Click Reset to confirm this action and complete “Compromised Windows Security” removal. Here, select Extensions and look for “Compromised Windows Security” or other suspicious entries. Click on the Uninstall button to get rid each of them. Now you will see a detailed dialog window filled with reset options. All of those options are usually checked, but you can specify which of them you want to reset. Click the Reset button to complete “Compromised Windows Security” removal process. This entry was posted on 2016-09-23 at 00:37 and is filed under Adware, Viruses. You can quickly scan the QR code with your mobile device and have “Compromised Windows Security” ads manual removal instructions right in your pocket. How did you remove “Compromised Windows Security” ads?